I made these in an attempt to channel my childhood. Every year at Christmas, my aunt would bring Peanut Butter Rice Krispy Bars topped with chocolate. They were delicious, and it was difficult for me to stop at one because I knew they wouldn’t be on the menu again until the following year. 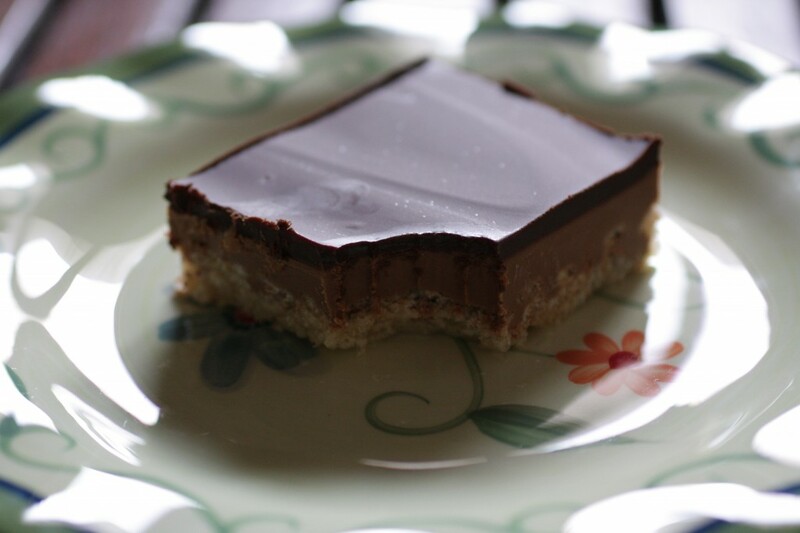 I still have a soft spot for those bars, so when I saw a grown-up version in the Baked cookbook, I had to try them. And now, I’m going to demonstrate how truly unsophisticated I am: these bars are good, but I still prefer the original. 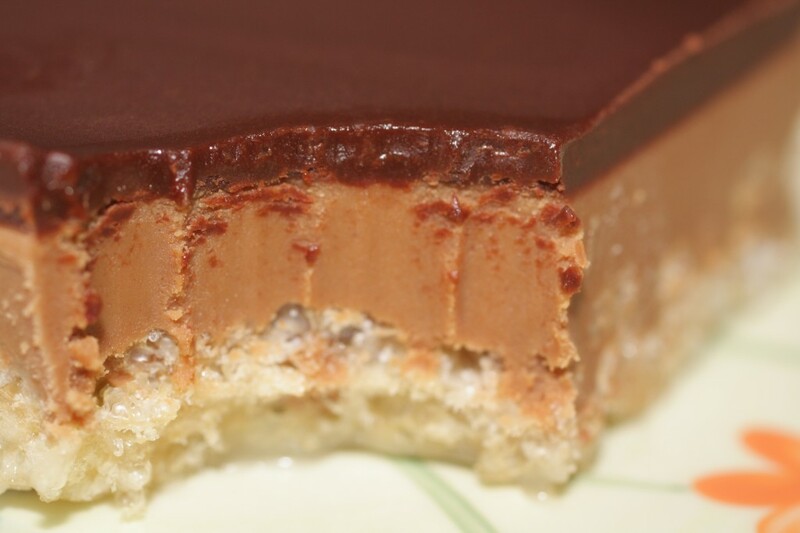 To me, the peanut butter layer overpowered the crispy layer. If I make these again, I will double the crispy layer, which I think will balance things out a little more for my taste. 1. Lightly spray a paper towel with cooking spray, coat the bottom and sides of an 8×8 inch baking pan. 2. Put the cereal in a medium sized bowl and set aside. 3. 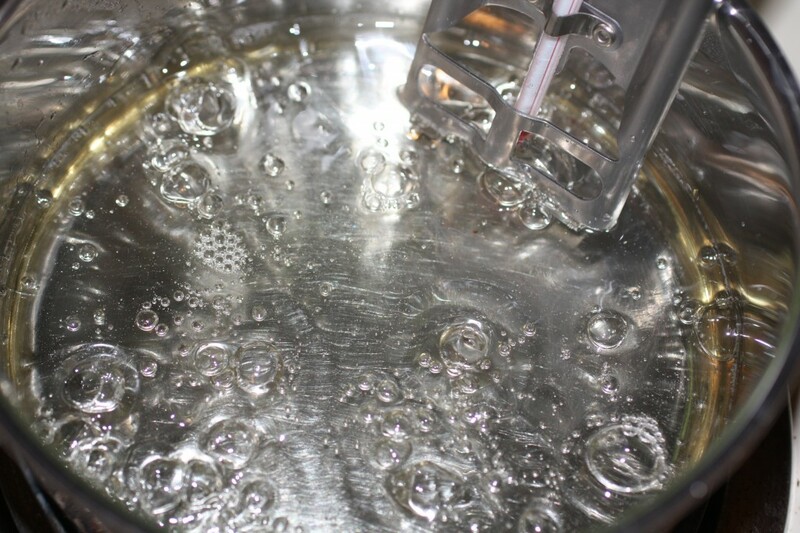 Pour the water into a small saucepan. Add the sugar and corn syrup, being careful not to get any on the sides of the pan. Stir with a wooden spoon to combine. Heat over medium-high heat and boil until temperature reaches 235F (soft ball stage). 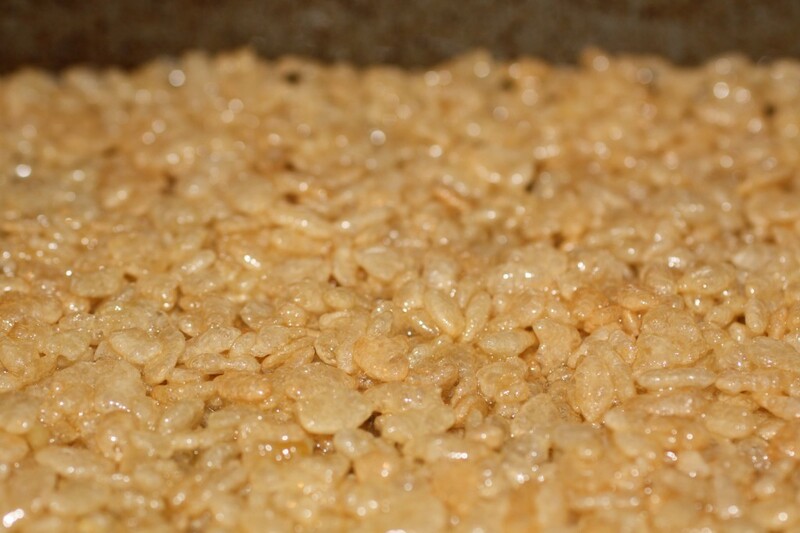 Remove from heat, stir in melted butter, and pour over crisped cereal. Stir to coat and transfer mixture to prepared pan. Press mixture into bottom of the pan (do not press up the sides). Let cool. 4. 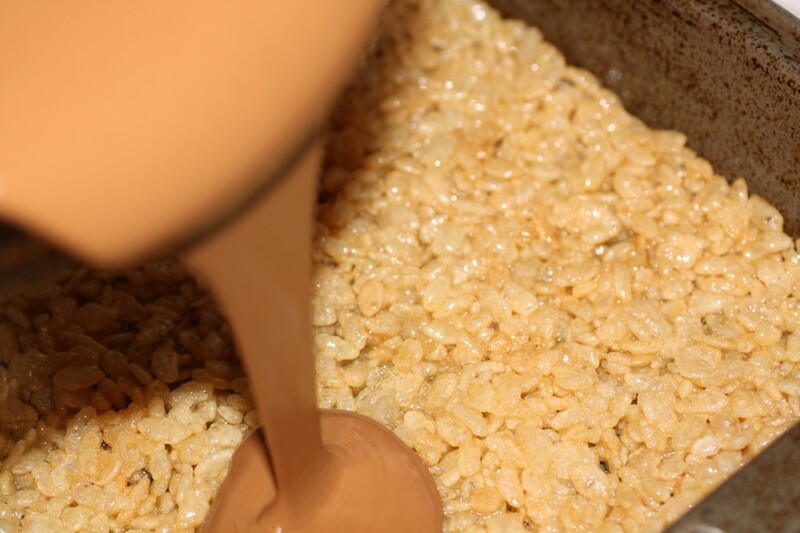 Combine the peanut butter and milk chocolate in a large heat-proof bowl and set over simmering water. Stir with a rubber spatula until mixture is smooth, remove from heat and let sit for 30 seconds. Pour mixture over the cooled crust. Refrigerate for an hour. 5. Combine dark chocolate, corn syrup, and butter in large heat-proof bowl over simmering water. Stir with a rubber spatula until mixture is smooth, remove and allow to sit for 30 seconds. 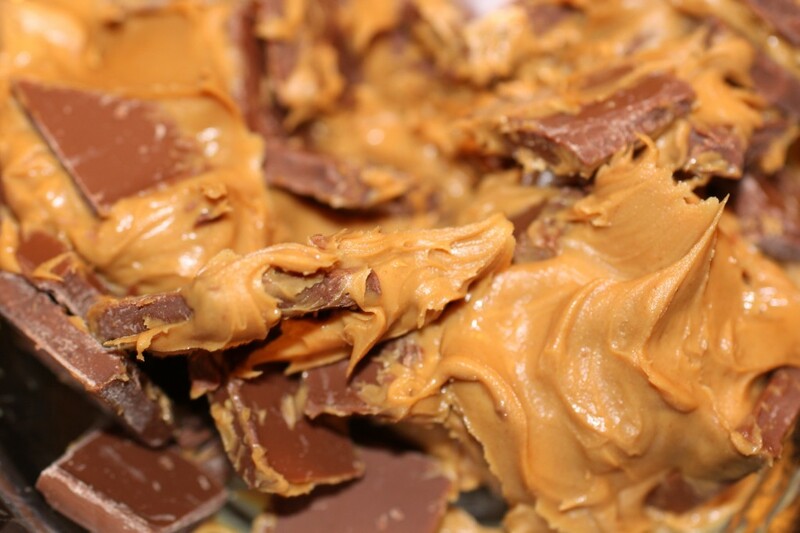 Pour over cooled peanut butter layer, refrigerate for an hour. 6. Cut into small squares – these bars are very rich. Store wrapped in refrigerator for up to 4 days. *When I bake, I always use the “bad for you” peanut butter. Skippy has a blended trans-fat free peanut butter that works pretty well, but for the best flavor, I still like my Peter Pan, trans-fat and all. Wow, these look amazing. Are your aunt’s version the traditional recipe with pb mixed in? Thank you so very much for stopping by my blog.. I picked a super terrific day to stop back at tours. I love this bar!! My children would adore this bar, your blog is just wonderful, happy to meet you. I am subscribing to your feed, like right now! Sara – yes, my aunt’s version were the pb/corn syrup version – I posted it today as part two. Donna – welcome! Thanks so much for stopping by. After all of the treats you were show-casing today, I’m glad I can return the favor.